Looking at the popularity of JQuery it is a must to learn for all the developers and designers. So, here we bring you a list of top 10 free online resources where you can master your JQuery skills. Learn.jQuery is the best place to start learning as it focuses on basics, deals with common problems faced by developer and makes you familiar with the standard practices of JQuery. 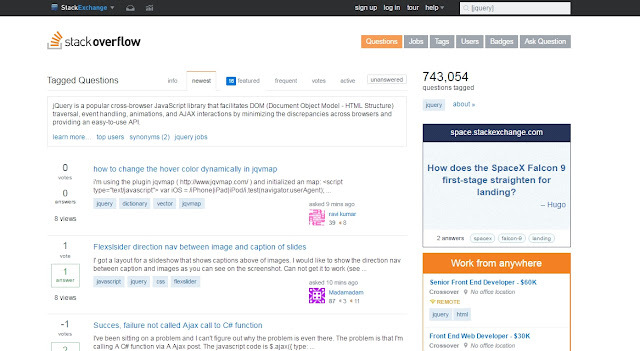 It covers topic such as JQuery introduction, events, Ajax calls, use of plugins, code organization etc. jQuery API Documentation is another place to start learning as it focuses on jQuery API, deals with common problems faced by developer and makes you familiar with the standard API of JQuery. Tutorialspoint has been in these business from a long time and explain things in the simplest way possible. 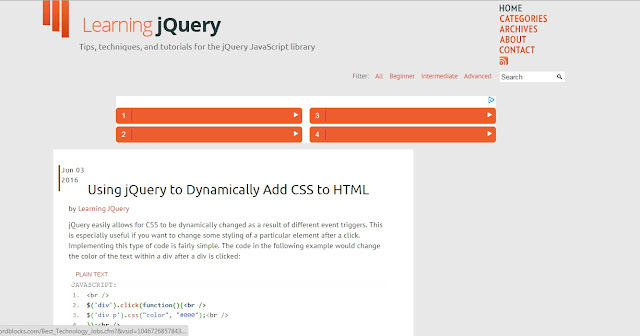 The JQuery course is very structured and can be understood even by a beginner. It starts with the basics and covers topic like attributes, CSS, DOM, AJAX etc. and then move towards advanced topics like Interactions, Widgets, Theming, Plugin and Utilities. 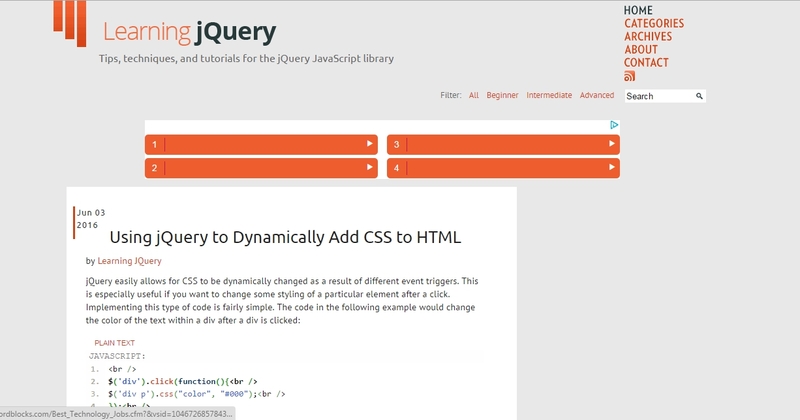 At the end of the jQuery tutorial, you can find more than 100 examples. With online editor, you can edit and test each example yourself. Codeademy is place to start learning jQuery as it focuses on basics, introduction of jQuery. It covers topic such as JQuery functions, dynamic HTML, jQuery events, effects and jQuery projects. Stackoverflow, the best website to learn jQuery is your own website, seriously. Give yourself a tough project and just google for solutions to any obstacles, there is no better way to learn than pure experience. You will write horrible code, and as fast as a couple days later you'll be able to recognize the horrible mistakes you made a week earlier, but never stop and never feel confident. w3schools is doing a remarkable job in providing tutorials on various technologies. You just name the technology and you will find a tutorial related to that on w3schools. The tutorials on JQuery covers every topic and has an online editor as well where you can perform things practically. The tutorial starts with an introduction of JQuery and then digs deep into the technology as we progress further. jQuery Fundamentals is designed to get you comfortable working through common problems you'll be called upon to solve using jQuery. To get the most out of this site, you'll want to read the content and try the various interactive examples. Each chapter will cover a concept and give you a chance to try example code related to the concept. 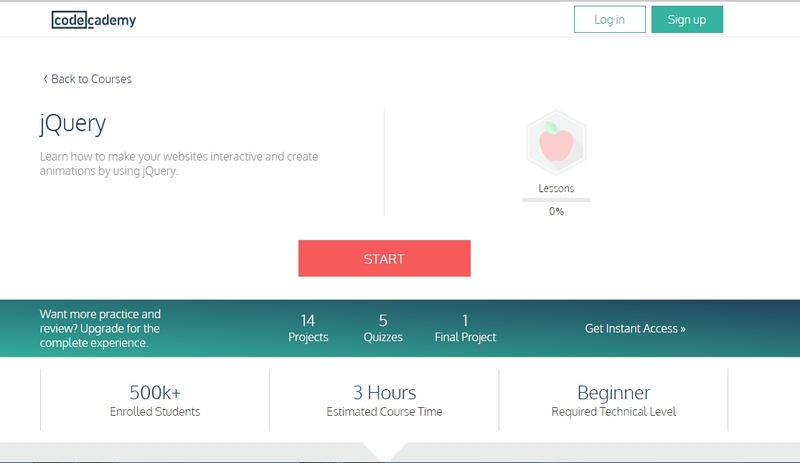 jquery-tutorial helps you learn jQuery online so that you can leverage your skills in creating animation and building interactive websites. 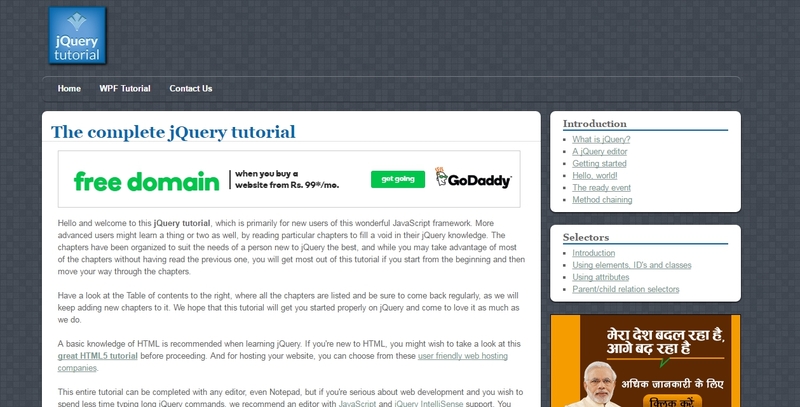 Tutorials covers all jQuery basics and step by step explanation to learn jQuery. This website provides tutorials for Bignner, intermediate and for Advace. 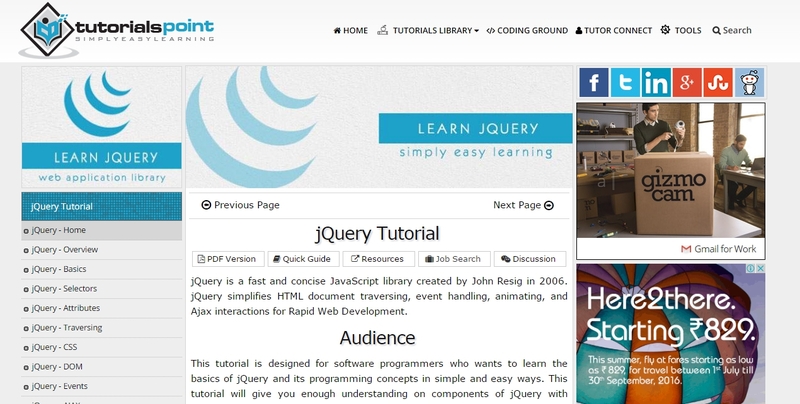 So these are the 10 the best free website to learn jQuery in easily and better manner. Hope you all will love those resources.